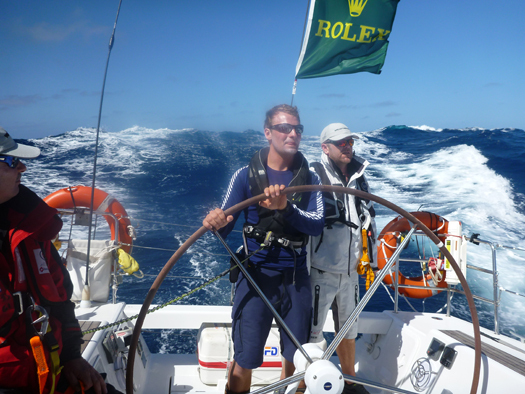 #rshyr – This will be my third year in a row racing 'Breakthrough' (a First 40) in the Rolex Sydney Hobart Race writes offshore sailor Barry Hurley, Afloat's October Sailor of the Month. 'Breakthrough' is a Sydney based boat owned and skippered by Mathew Vadas. He sails it with a local crew for much of the year, but I work with him remotely all year round in preparation for the Race. Come December, I normally bring some European sailors South for the event to complement the skillset of the regular crew based on experiences throughout the year. It's an arangement that works well for everybody. Following the very stormy race last year and a busy local season, much of the boat's sail wardrobe was reaching end of life, so for this years campaign we have had the opportunity to plan a new sail inventory from scratch. We started working on this last January while last years race was fresh in our minds. By now many of the new sails have arrived and the boat is sailing regularly to gather data in different conditions which we can use to tweak the design of the last few sails in the coming weeks. We have also upgraded the standing rigging and headsail foil to reduce weight and windage up high since the majority of the competition in our class all have carbon masts and we used to suffer in heavier airs as a result. Right now we're going through all the iteratons to make sure that all the changes made actually work together, and that we haven't introduced any unexpectded weaknesses in varying conditions. So far so good though, and the boat seems to be responding as expected. Sometimes it's the tiny little things that count however. Last year during the tough condtions crossing the Bass Straits we discovered that when the hull flexed in one particular manner it would somehow cause several of the lockers down below to open and eject their contents all over the boat. It didn't really slow us down, but it made a lot of unnessary work tidying and cleaning the inside of the boat, which was no easy task in itself in those conditions. It was a distraction, and could have caused somebody to slip and hurt themselves. Needless to say the locker catches have now all been made stormproof. My experience has taught me that it's this sort of attention to detail in boat prep that makes all the difference in an offshore race, but often the weaknesses don't show themselves until the boat gets pushed beyond it's normal routine. After crossing the Bass Strait four times on this boat we're only just getting to the stage where we feel like we're ready and fully prepared to keep pushing hard in every eventuality. Apart from the final selections which are still coming together, it is looking like three of the crew will have done two prior iterations of the race with me, and another three have completed the race once with me before now. Continuity of crew helps immensely, and just like with the boat it's only after sailing many hard miles that you really appreciate and understand everybody's individual strengths. Myself and my good friend, Ben Hunter (Australia), will manage tactics and navigation between us. Ben sails the boat regularly and is invaluable in providing feedback during the year as well as organising all the logistics of modifications as our plans evolve. The two watches will be led by Adam Carpenter (Australia) and Kenny Rumball (Dublin), both of whom are extremely talented, experienced sailors, each with the right attitude to lead a watch and keep pressing the boat through the more difficult times. One unusual aspect of this race is the enormous amount of HF radio communications mandated by the race organisers. Catherine Halpin (Dublin) will distil hours of mandatory fleet radio chatter at the chart table into a few snippets of information that can help drive tactical decisions. She will also stand watch as a bowman opposite race veteran Tom Guy (Australia). With myself, Kenny, and Adam doing most of the driving, owner Mathew Vadas will concentrate on sail trim for one watch, opposite Alexander Rumball (Dublin). Many of the tactical decisions for the race can be made during the week in advance, with the East Australian Current (of 'Finding Nemo' fame) quite well computer modelled, and the Southern Ocean weather systems excellently forecast. This makes life easier because your inital preferred route need only be impacted by the actions of your competitors and the need for defence or offence. That said, rounding Tasman Island where the weather is volatile, the Tasman River and the tide play a huge role, and the preferred tactics change by the hour. The last day of the race, sailing up that river is often the most tactically challenging, just when physical and mental strength are running low. It is also where the race is regularly won and lost. By now I have several cheat sheets prepared and laminated, reminding me from previous experiences what to expect and where losses and gains could happen at each state of the tide on the way up the river. This makes decisions easier and quicker allowing us to keep pushing for boatspeed and concentrating on our performance againt the boats around us. I like to think that I've figured out the fast way up the river by now, but history shows that the race often comes down to a little bit of luck with the weather over that last fifty miles. It is a piece of water that throws something new at you every time you sail it, and it's never an easy day on the water. With Mathew being in his 70th year this year, as well as it being the 70th Rolex Sydney Hobart Race, a safe arrival in Hobart will mark one of our primary goals being acheived. Having improved our performance each year to date with this boat, and having taken massive learnings each time, it's fair to say we hope to at least cause worry to those on the leaderboard in our IRC class. Due to its almost straight line trajectory, this race can sometimes favour boats at either end of the rating spectrum. Being one of the smaller boats at just 40ft, our position in the overall standings will be somewhat a result of the weather patterns during that particular week, whereas our placing within our class will be a true measure of success. Hopefully after so much prep work in advance and the careful combination of experienced crew ready to push everything to the limit, we can hold our heads high in Hobart, priveledged to have enjoyed another classic offshore race in great company. The afterparty in Hobart on New Year's Eve will more than compensate for any hardship experienced along the way.